Have you ever wanted to learn another language? Maybe even a third language? Perhaps a language that could be shared among one’s group of friends to pass clandestine messages? They say learning another language is beneficial to you. Not only does it challenge your brain to stay active, but it could help with your intelligence and depending on one’s age, could even stave off some degenerative conditions like Alzheimer’s. Well, this item will help you with that. The experts at the world famous language learning institute Rosetta Stone have developed a program which should work those neurons. 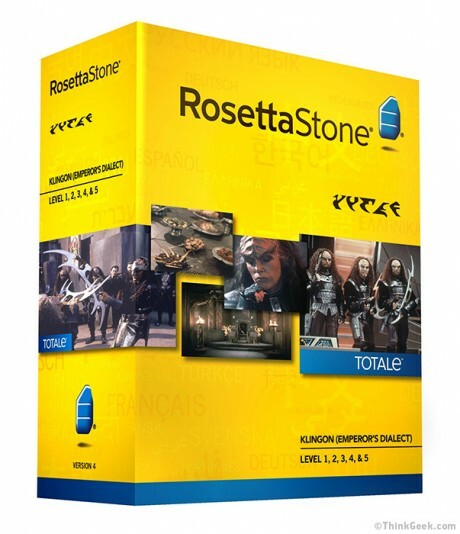 It is the Rosetta Stone for Klingon! This program is set up like any of the other programs. It has native speakers and experts teaching you the proud language of warriors. It is a fully immersive program that breaks down this challenging language and will have one speaking Klingon in months. For $270.00, one receives the complete package which includes, language software that will bring the student up from simple greetings to arguing their favorite topics, live conversation sessions with native speakers guaranteed to be from the Beta Quadrant, language enhancing games, and a free downloadable companion app for your mobile device so one can learn on the road. It will have the curious and determined person well versed in conversational Klingon in no time at all. This would be a great item if it truly existed. Many people would clamor for this prized program. Coupled with the Klingon dictionary, which does exist, this would be an excellent program for the stifled and hidden warrior. It would be a great buy for couples that want to express their true feelings for each other, but don’t know quite how to do it in their native language. Or it could be the missing link to making one the Star Trek geek they have always wanted to be. This program could be the first in a series of other movie languages that others have wanted to learn. The next one developed could very well be Huttese, or Nav’i, or Old Elvish from Middle Earth. Which one would you like to learn? The possibilities are endless. The language program was one of the few amazing products featured on the site ThinkGeek.com on April 1, 2014. 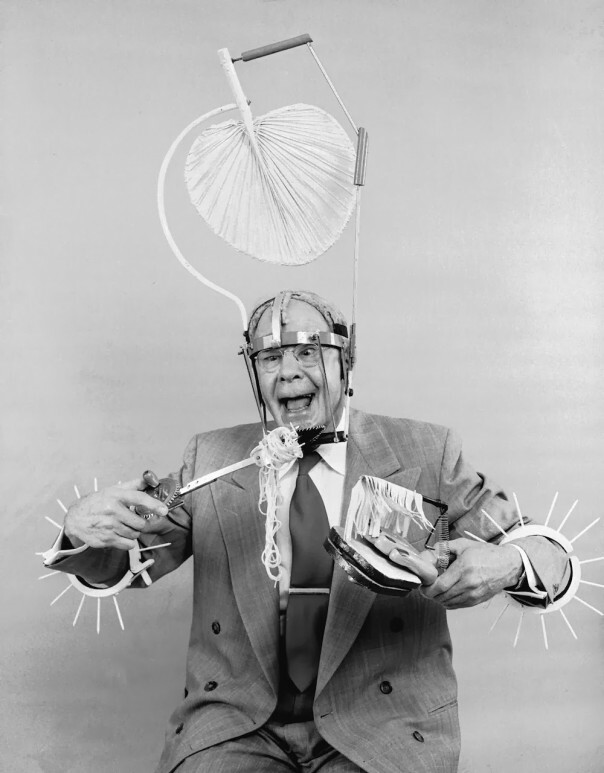 Here are some more creative products that were featured and could find a foothold in the market place if they were only real. Another item that was offered was the Mr. Beard Beard Machine. This is a parody of the Kuerig single cup coffee dispenser. It operates by placing a B-cup (beard cup) into the machine and closing the lid. One places their face into a cradle in the machine, and in moments a fully grown beard will be on the face in the style of your choosing. 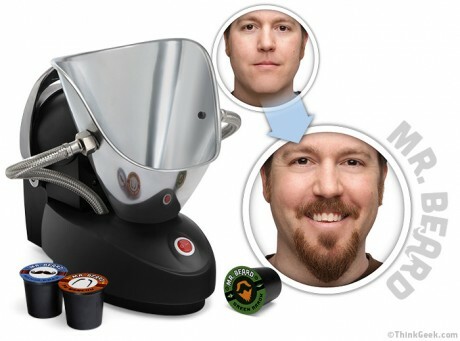 One chooses the style and color of the beard from the selection of the B-cup. The B-cup, similar in size and shape to the familiar K-cup of the single cup coffee machine, contains real human hair particles. The product description claims, the “new beard can be gotten wet and cleaned just like your own hair. You can even swim while wearing it!” It can be shaved and styled to your liking. Each machine comes with a “5-pack sampler B-Cup Pack of some of the most popular styles: Freddie Mercury, Handlebar, Fu Manchu, Green Arrow, and ThinkGeek Founder.” Supposedly, there are over two hundred different B-cups available to choose from so that one can have an endless variety of styles and colors of beards. This would be great if one is beard challenged, or just thinking about having a new style and look for just a day or two. This would be especially popular around Halloween when one wishes to dress up in say pirate costumes. One could gather the whole crew together and instantly create the facial aesthetics that accompany the outfits without having to deal with the messy fake hair and latex. Make-up Artists would love this gadget, as well. It would speed up the time needed to create those items. It didn’t say if it would work on women, so I would assume it does. Women who would want to appear more masculine probably could use it. They could, also, use it for the purpose mentioned above, namely Halloween costumes. This could be a great seller, if it existed. It would be a stellar gift for any one wanting or needing more facial hair. This could be the product of the decade! The world needs more beards, so let’s do it! 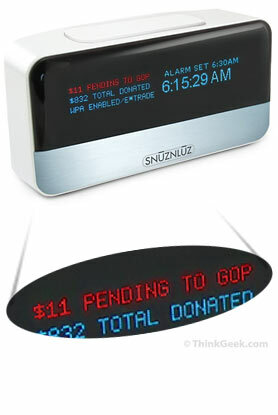 Another item featured that could be of interest, is the SnuzNLuz – Wi-Fi Donation Alarm Clock. This could be a great motivator for anyone having trouble getting out of bed in the morning. The idea is that when the alarm sounds and if you hit the snooze button it will begin donating money out of your bank account to your most hated charity. The more often one hits the snooze button, the more money is drawn out of your account. The amount is specified by you and the time increments, too. Say one sets up the clock so that every time the snooze button it pressed, it donates ten dollars to the National Endowment of the Arts with the snooze time of twenty minutes. Or, another set-up, if one could afford it, five hundred dollars to the Democratic Party with the snooze time being every five minutes. The choice is done by the user with the idea that it should be a motivating amount of money and an organization that the user is not too fond of. Supposedly, it supports over one thousand banks and over six thousand charities and non-profit organizations. With that said, there should a wide range of choices for the user to find one organization they really don’t care for, or maybe even despise, for this purpose. It would be interesting to see if one of these products makes it on the market in the future. Some of these products are more viable than others to get to market, but these last decades have seen all numbers of products hit the stores. Which one will be first, who’s to say? If the market exists, that product will be developed. The way to encourage the production is to go on to various forums and get the word out there. Qapla’ my friends! I have learned it to be a Klingon farewell, which means success, or literally translated; many victories. Be sure to read Erich’s book, Is Love Ever-lasting? available in digital download through Smashwords.com. It will also soon be available at other digital book stores, including Apple iBookstore, Barnes & Noble Nook, and Kobo.